Intimus 120 CC5 Micro Cut Shredder is a functional document shredder that is suitable for large office departments. This state of the art product by Martin Yale is an excellent combination of shredding capabilities, ease of use, and economy. It sports a shredding capacity of 12 and shredding speed of 27 feet/min. Its feed unit has a 12.2” wide throat that is quite demanded in office shredders. This feed throat can accommodate paper sizes as big as A3 easily. The durable cutting unit of this shredder destroys everything to 1/32” x 7/16” cross cut particles, making it a P-6 security level shredder. 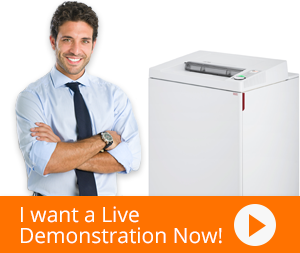 120 CC5 makes document shredding remarkably intuitive through various technologies. This micro cut shredder features automatic on/off functions that remove the need to manually perform these tasks. Auto reverse facility is also something users enjoy as jams are cleared automatically through reversal of the motor. The i-Control element integrated in it makes shredding amazingly easy as all functions are accessible via buttons. The 120 CC5 is equipped with Dynamic Load Sensor that informs operators when they overload the feed unit, thus helping them in avoiding jams. Intimus 120 CC5 also comes with illuminated indicators for standby, basket full, door open, and paper jam located on its front panel. EcoLogic function incorporated in it minimizes energy wastage through intelligent use of its standby mode. The 2x2 wooden cabinet over which the shredding unit is built catches all the waste that leaves the shredder. It has separate compartments for paper and non-paper shreds for efficient waste management. Intimus 120 CC5 Micro Cut Shredder presents the optimal data disposal solution to high-end organizations.